Panasonic reveals details of its new GT60 plasma TV series | What Hi-Fi? The new Panasonic 2013 TVs are coming thick and fast here at the European press launch in Nice, and as we predicted there's a replacement for 2012's Award-winning TX-P50GT50 and five-star TX-P42GT50 plasmas called – you guessed it – the GT60 range. The Full HD neoPlasma TV is available in 42in and 50in sizes, features new red phosphor for improved colour reproduction and a 3000Hz Focused Field Drive (FFD) for smoother motion handling. It's equipped with a Hexa processing engine, and is a 2D/3D THX-certified display. Other features on the GT60 range include a customisable 'my Home Screen', for quick access to your favourite content, 'Swipe & Share 2.0' for transferring videos and photos from a smartphone or tablet to the TV (and back again) and voice guidance and interaction. Find out more about the new 2013 Panasonic TV range in our CES round-up. 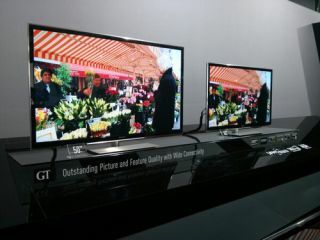 And see details of Panasonic's 2013 ZT60 flagship TV here. Enhanced Viera Connect functionality allows more options for streaming video content, accessing apps and social networking, while an optimised-for-TV web browser brings the internet to your TV. There's also USB HDD recording. A new Eco navigation system lets you adjust a whole range of energy-saving features on the TV, including Intelligent Auto Standby which automatically powers down connected AV devices if they're not being used.